My defense of Salinger is simple: I think The Catcher in the Rye is the first book that truly captures the vernacular of adolescence. In a media environment that is absolutely saturated with adolescent drama and humor, this may strike you as an unremarkable accomplishment. 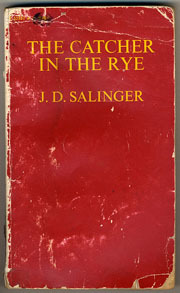 But The Catcher in the Rye was written just as youth culture was entering into the popular conscious, so Salinger deserves credit for anticipating a pretty significant cultural sea change. I think that’s right. In 1951, Catcher in the Rye really was rebellious and titillating. By 1974, when I read it, not so much. By 1999, it might as well have been distributed on folio leaves. It’s become part of the high school canon because it’s a book by a serious author that also seems genuinely appealing to teenage kids, and it’s not as if high school English teachers have a huge selection of books like that to choose from. But frankly, it’s probably not all that appealing anymore. By the time most kids get to their first American lit class these days, they’ve already spent half a decade reading stuff exactly like it. Time to revise the canon.